Is It Okay to Pray for Your Weekly Bread? Is it okay to pray for your weekly bread? How about your monthly bread? So the question I ask in today’s little lesson, is it okay to prayer for more than just your daily bread? 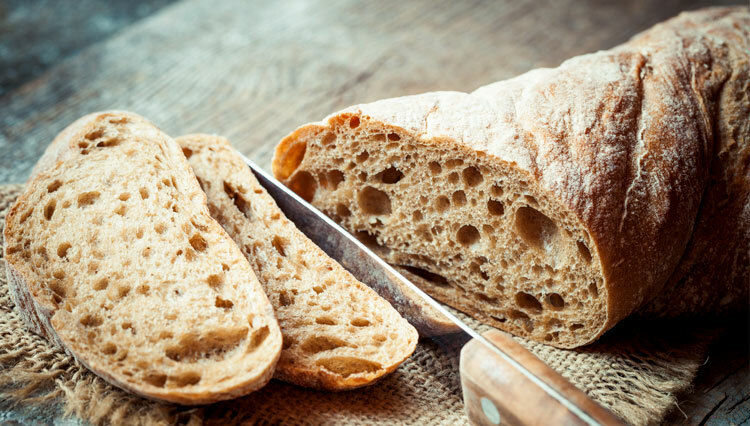 Is it okay to pray for weekly or monthly bread? Fundamentally what I’m asking is, is it okay to ask for more than just bread, or was Jesus literally talking about only praying, and it’s only appropriate, if you’re going to ask for anything, only ask for bread? We need to get hold of the fact that God is not trying to make us miserable. So many folks seem like they … you know, “God wants us to live a harsh, unenjoyable life. The more miserable you are, the happier God is.” I don’t buy into that at all. He has given us all things to enjoy, and obviously in the context of The Bible he’s talking about legitimate, non-sinful kind of enjoyments. Well there’s nothing sinful about eating an apple, of course unless it’s the forbidden fruit and you happen to be in the Garden of Eden, and your name is Adam or Eve. For all the rest of us, you know God loves you when you eat a crispy, cold, sweet apple. You know God loves you when you eat all kind of other things and when you smell them. Life is just so good and full of so many blessings from God. Oh, my goodness, because he loves us and he’s trying to get our attention to say, “Hey, there’s somebody up here that really loves you. Remember me when you’re enjoying those cherries or that steak,” or whatever it is that you like or your favorite food or vegetable. God’s good, God’s good, God is good. So when Jesus said, “Give us this day our daily bread,” he’s not limiting, obviously, to making prayer requests in the food realm over for bread, or in the realm of requests for your own needs, only for bread. That’s why I asked is it okay to pray for your weekly bread? Could we actually store some up? Well, I suppose so. I suppose do. But I think what this prayer indicates is that God is wanting us to say certain things that will remind us of how good he is. He’s the provider. Also, think about it, bread, although the Manna fell from heaven. As it were, it appeared after the frost evaporated in the mornings when Israel was coming out of Egypt and into the Promise Land and so forth. But when you pray “Give us this day our daily bread,” you’re probably not expecting loaves of break to be falling from heaven, right? There’s a lot of work that goes into a load of bread. From planting the seeds of the grain to making sure the grain is protected, or the plant rather is protected when it sprouts, making sure it survives, grows, produces the grain, harvesting it and so forth, extracting … separating the wheat from the chaff, all that stuff. Grinding the grain, making the flour. Oh my goodness, the process that goes into break, it’s a miracle that anyone ever discovered how to make bread, the complexity of it. But in any case, if you’re going to get bread, you’re going to have to get the ingredients to make it or you’re going to have to buy it from somebody else who did. So this prayer is not a prayer that taken within the context of the whole Bible, would make us just think that God’s going to drop bread from heaven because we prayed for it. But it helps us to recognize that ultimately, even though there’s so much human activity and work that went into producing those loaves of bread, its source is from God. God provides the rain that grows the grain and so forth. So that’s why we thank God before every meal, because we recognize his hand in it even though all the human activity was involved in getting it onto our plates, including a little bit of our activity as well in preparing a meal. “Give us this day our daily bread.” A reminder, a reminder that God is our source, and that he is good. All right, so I encourage you today to be thankful and to recognize all the blessings that we all enjoy all the time, every day. Millions of blessings that escape our consciousness unless we think about it, that are all from the hand of God. In every little message, God is trying to get attention our, saying, “I love you. Seek me, and life only gets better.” Amen. All right, thanks for joining me. God bless you.